In 2013 internationally-renowned artist Barbara Rae CBE RA RSA began a series of journeys of discovery into the Arctic, following in the footsteps of her namesake, Dr John Rae. She first travelled to the Northwest Passage with One Ocean Expeditions in 2015, returning in 2016 and 2017. The Northwest Passage is a collaborative partnership between the Royal Scottish Academy (RSA) and the Royal Academy (RA), London. A larger assembly of works was shown in Edinburgh in summer 2018, and a smaller selection will travel to Canada House, London. This project, with Art Fund support, forms part of RA250 UK: exhibitions and events celebrating 250 years of the Royal Academy of Arts. Barbara Rae studied drawing and painting at Edinburgh College of Art. She taught in secondary and higher education before opening her own studio as a full-time painter and print-maker. Her work is in public and private collections all over the world. The inspiration drawn from the story and travels of John Rae is acknowledged at the start of the exhibition with a view of his birthplace, the Hall of Clestrain, Orphir (no. 2). There are works which were produced where their paths crossed in the Arctic, and the routes taken by John Rae in the 19th century and Barbara Rae in the 21st century are marked on a map in the accompanying exhibition catalogue. 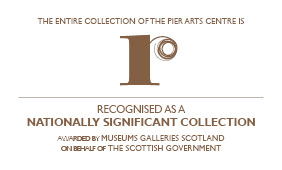 The Pier Arts Centre has expanded on this connection, highlighting the role played by the oldest parts of their building in the history of the Hudson’s Bay Company, and the great contribution by Orcadians who worked for the Company. John Rae himself is represented by his snowshoes, on loan from Stromness Museum, and his influence on Barbara Rae and his legacy in both Orkney and Canada is further explored in catalogue essays by Tom Muir and Tagak Curley. Barbara Rae’s fascination with maps and the history of Arctic exploration makes subtle appearances in Sea Ice – Northwest Passage (no. 1) and Fort Ross (no. 96), and, with another nod to John Rae, two prints showing the Halkett Boat (nos. 127 and 128). The cost of human endeavour in these surroundings is remembered in Hartnell Grave, Beechey 1 (no. 46). Rae’s approach to her work is grounded in the history of a place and its people. The spectacular landscapes and colours of the Arctic immediately strike the viewer, but, looking closer, some of her themes reflect traces of human occupation and the passing of time. One gallery contains a series of views of Hudson’s Bay Company huts. The simple wooden buildings are at once monumental and timeless, domestic and pathetic, with ladders and cans among the items littering the foreground. This dichotomy is best represented by Trading Post (no. 36) and Ghost Hut – Port Leopold (no. 42): the empty huts are now part of a very different trade. Barbara Rae readily acknowledges the privilege of travelling to this remote part of the world, but is wary of the long-term effects of increasing tourism on Arctic landscapes and people. That ships can navigate the Northwest Passage is a result of the retreat of sea ice. Her work reflects this tension between beauty and fragility. This intensity of colour is magnified by metallic and fluorescent paints, especially in Devon Island Beach (no. 50), and works produced around Peel Sound (nos. 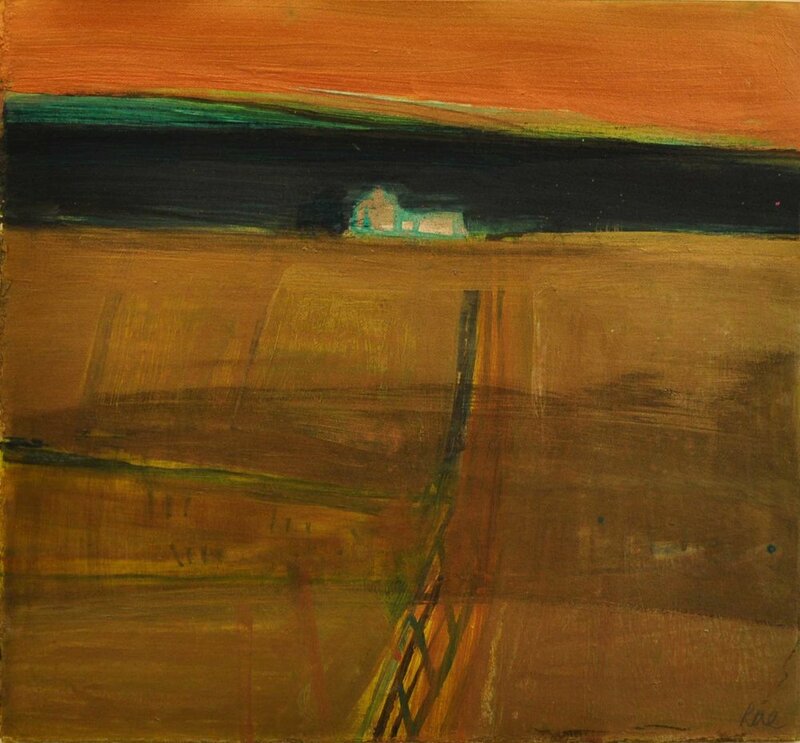 105-107), with bright strips on the horizon from the setting sun. The largest work in the exhibition, Dark – Passing Peel Sound (no. 92), is unusual in being executed on canvas and unframed. Examination of the surface shows the variety of textures, materials and techniques used by Rae, and the subtlety of tone and subject within one large, blue square. It is a privilege to be able to see Barbara Rae’s work in Orkney, but her themes and our shared history make it entirely appropriate that the Pier Arts Centre should host this beautiful and timely exhibition. It is exciting to read that the artist is still working through the inspiration of her voyages to the Arctic and we look forward to seeing which direction she takes next.